When I first reviewed Terra Plana’s Lucy shoe back in May, I honestly thought I would never find a shoe I loved so much. I wrapped my heart around those shoes, said “I Do”, and never looked back. Well, I’m thrilled to be able to say that Terra Plana has stolen my heart even more on the next go-round with their Vivo Barefoot Dundan boot. And, keep reading because, yet again, they’ve generously agreed to give readers of The Greenest Dollar a 20% off coupon. Yay! For those of you who have already read my Lucy shoe review on why Terra Plana is so unique, you can skip this section and scroll down to the next. But if this is your first time ever hearing about Terra Plana, and their Vivo Barefoot line, then stay with me here. You won’t be sorry. Now, Terra Plana’s Vivo Barefoot line is like no other shoe you’ve ever worn. They’re shoes that feel nothing like shoes. Here’s why: 99% of the shoes out there mold your foot into a certain shape with the insole. When you put them on, your foot is forced into a certain shape, and you feel like you’re wearing shoes. But Terra Plana’s Vivo Barefoot line doesn’t do this. This line is designed to simulate barefoot walking. Your foot is left in its natural shape as you walk and your toes spread out, free and unencumbered by the shoe itself. The reason why Terra Plana makes shoes like this is because of the health benefits. Human beings were designed to walk barefoot, and our bodies are just naturally happier when they’re not being forced to walk in a certain way by our shoes. The Vivo Barefoot line keeps your feet in their natural form with an ultra-thin sole that lets you feel every rock, brick, and pebble you walk on. With these it’s really hard to trip, because your feet are able to feel and respond to the ground underneath. You always know what’s going on because you can feel it. So, what’s so special about these boots? First of all, they feel like a part of my skin. I don’t feel like I’m wearing a “boot” at all. Here’s an analogy: If I was a Scottish clansman and painstakingly handmade a custom pair of boots from the softest leather and then wore them every day for six years through the highlands, they might be as comfortable as these boots. Maybe. With the Dundan, you get that “custom made and completely broken in” feel the moment you pull them out of the box. No kidding. I also did not get one single blister from these boots. I have worn the mess out of them since they came in, and this includes carting them across the Atlantic to Barcelona, where I walked 10+ miles per day in them for 11 days. I also need to take a minute to rave about the sole. Now, you might think a “thin sole” means that it could easily be punctured by something sharp, like glass. Not so. Need proof? Well, A and I love to dance, and when we were in Barcelona we went out dancing in this really dark, really packed dance club. And since my Dundan boots were the only shoes I brought, this means I went out dancing in them. The floor was littered with all kinds of stuff, most of which “crunched” while we were dancing. I could feel it through the thin sole, but couldn’t tell what the heck it was. After about an hour the lights got brighter for just a bit, and I was able to look down and see what I’d been dancing on all this time. People had dropped beer bottles and glasses all over the floor, and I’d been grinding my feet into it for the past hour. And the soles hadn’t gotten punctured once. Yes, the sole of the Dundan boot is thin. And yes, you can feel everything under your feet. But this sole is tough as nails. You’d really have to put some effort into it to puncture the bottom of these boots. Another great thing about the Dundan boot is that it’s warm. It has a thin layer of insulation on the inside for chilly winter days. And they’re water resistant, so you can tromp through the snow and not have to worry about ruining them. 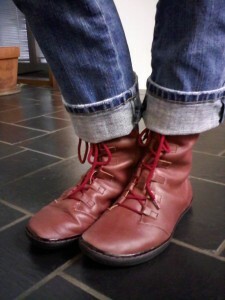 Another cool thing about the Dundan boot is that they’re made from vegetable dyed leather. Vegetable dyed leathers are much more eco-friendly than traditional dyed leathers because they don’t use any harsh chemicals. You can find out more on the benefits of using vegetable dyes on leather here. Why Is Terra Plana Green? So, what makes Terra Plana such a green company? Well, they add recycled elements to all their shoes. Each shoe is different, but there could be recycled rice husks in the sole, recycled foam in the footbed, recycled leather in the shoe itself, or recycled PET bottles in the mesh. Terra Plana is also the winner of the Observer Ethical Fashion award, and recently picked up an award from Drapers for Ethical Retailer of the Year. They’re definitely taking some cool steps to make sure their business is green (and this includes using old parachutes and old coats in their shoes!). So, want to try a pair for your very own? Well, Terra Plana has generously agreed to give us all a 20% off coupon. Thanks Terra Plana! The coupon is for their Vivo Barefoot line only, and is good from Oct. 19-Nov. 30. Just enter the coupon code “GREENEST20” when you check out. You can click here to check out their Vivo Barefoot line. So, what’s my last word on these eco friendly boots? Well, if you couldn’t tell already, I absolutely love them. Terra Plana’s Vivo Barefoot line is amazing, and I love feeling like I’m not really wearing a shoe at all. My feet feel so free in these boots, and I know I’m going to be wearing them all winter. Love the red boots! I may have to put these on my wish list. Did you find it necessary to order up a size per the instructions on the web site? Recently, I’ve been going through my closet wondering why I have so many shoes that are uncomfortable or that I don’t wear frequently. I’ve thrown or given away several pair. I suspect that if I buy these boots, they’ll be in the frequently worn category. hmmm….. Yes, I normally wear a size 8, and this line does run small so it’s probably worth it to get one size up. I did the same thing this year; I donated all the shoes I rarely wear or were uncomfortable. I’m so glad I did! I noticed that the ones that were left were all the shoes I’d spent more money on, which was a good lesson. It definitely pays to buy fewer shoes, and spend more on the ones you do buy. The boots are definitely pricey, but they’re extraordinarily well made. They will last for years, and they’re definitely comfortable to wear. So, I think they’re worth the investment. 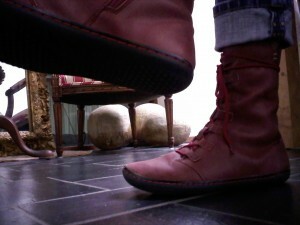 Love your red Dundans, Heather! This post prompted me to finally pick up a pair of the tumbled brown Dundans, which arrived today. They’re everything you said: light, comfortable, warm, and good-looking. I’ve just started wearing Vibram Five Fingers for weekends and after-hours. Now I’ll be able to carry the good footwork throughout the winter/workday, too. Thanks for the great review. I’m so glad you like them! How do you like those five-finger shoes? I’ve seen them and am intrigued by how they look but also how comfortable they’d be. Did the coupon work for you? Actually, I bought my Dundans on sale elsewhere so didn’t use the coupon. The Vibram Five Fingers (VFFs): these are absolutely the most comfortable thing I’ve ever worn on my feet. If I could wear them all the time, I would. They’re like Isotoner gloves for the feet–flexy, stretchy, and supple. If your second toe is significantly longer than your big toe, there can be issues with fitting (they’ll stretch width-wise, but not lengthwise), but once fitted, they feel GREAT. Try them! Hi, i had been thinking of buying a pair of these for a while and after reading this review and the comments, took the plunge. (They arrived yesterday and they are beautiful! However, I am concerned they may be a little small, I am a size 6 and that’s what I ordered. My toes are pretty much on the edge and I remember reading somewhere that you should have about an inch of space. Apart from that they fit beautifully and i love them, so just umming and ahhing about whether to exchange them for size up.